My W. Michael Blumenthal Fellowship at the Jewish Museum Berlin on the topic Didactics of the Middle East Conflict ended in the beautiful month of May. During the past seventeen months, I have been intensively engaged with continuing education on this politically contentious and very emotionally charged topic, as well as with the question of what we as teachers of social studies or educators working outside of school systems can or should not do, in order to best approach the topic of the Near-East conflict with students (more at: www.jmberlin.de/fellow-rosa-fava-and-her-research). In retrospect, one of the highlights of the conference, which I organized in early April 2018 in order to bring together educators focusing on the Middle East conflict and Anti-Semitism with museum employees working in the areas of education and the Academy programs . 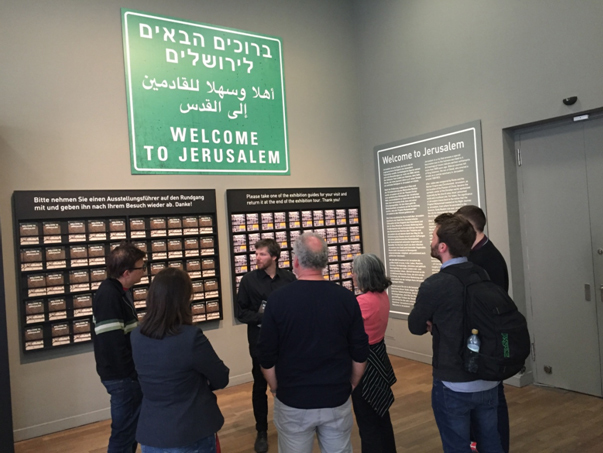 Since the first conference in September 2017, the parameters had changed somewhat, since the opening of the Welcome to Jerusalem exhibition made the Middle East conflict an (even bigger) presence at the Jewish Museum. And so it seemed all the more important to me to promote the exchange of experiences, approaches, and perspectives among influencers, because this sort of exchange ensures the quality of political education work. And like the first conference, it was enlightening to combine perspectives from within and outside of the museum (for more: see this blog post). First, doctoral student Christoph Wolf, who researches notions of teaching about anti-Semitism at the University of Hannover, presented the initial findings of his work: He interviewed twelve teachers at secondary schools in Hannover and the surrounding area about their experiences with hostility toward Jews at their schools, and their understanding of anti-Semitism. His motivating impulse was to research teaching and learning about the Middle-East conflict from a didactic perspective, because background knowledge of the conflict is often viewed as a means to prevent or counteract anti-Semitic attitudes. In his first step, Wolf wanted to determine the teachers’ prevailing attitudes toward anti-Semitism. The final results of his ongoing research, which is structured as a qualitative investigation, of course cannot be predicted, but two observations concur with the experiences of the educators and museum employees: First, the teachers questioned understand anti-Semitism to mainly be clichés and attitudes that are hostile to Jews, and which arose from National Socialism, neo-Nazism, and right-wing groups. Second, they only see a connection between anti-Semitism and the Middle East conflict among refugees, that is, students from Syria and their families. This attitude among those interviewed reflects discourse in the media over the past three years, since the “summer of migration” (also known as the “refugee crisis”). In discourse in the media and among experts, “refugees” and “Muslims” were the center of focus as bearers of anti-Semitism. Both imply removing current expressions of anti-Semitism from (native) German contexts, instead ascribing them to the “other” and externalizing them. It was surprising that observations in the classroom followed those in the media so closely. For this reason, I am very excited to see Christoph Wolf’s dissertation, in order to gain deeper insights into the precise logic motivating those interviewed. We received a brief introduction from an employee in the education department while visiting the Welcome to Jerusalem exhibition. The central topic of the exhibition was the holiness ascribed to the city. 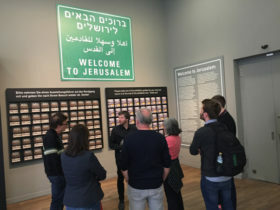 For this reason, the Jewish-Arab or Israeli-Palestinian conflict was mainly addressed indirectly in the exhibition, with one room presenting it explicitly. However, our task was to interpret the exhibition in a manner that is at odds with its original conception, and to direct our attention at the following questions: Where were further direct or indirect connections to the conflict to be found? Do they lead visitors to deeper reflection, or could they also prove problematic? 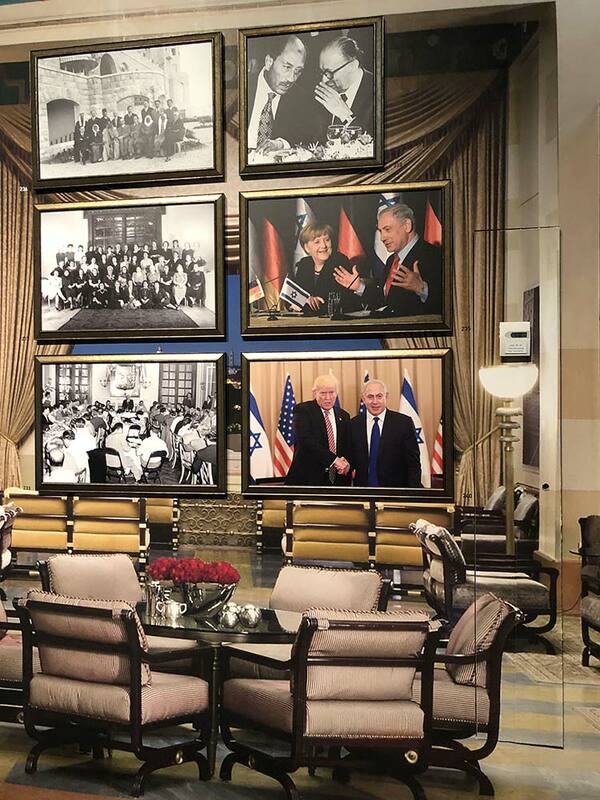 One of the participants pointed to possible connections to classic anti-Semitic patterns of thought: People who use widespread conspiracy theories to interpret the world and who assume that “the Jews” control politics can find their world view confirmed in large-format photographs of Benjamin Netanyahu with Donald Trump and Angela Merkel during discussions at expensive Jerusalem hotels. 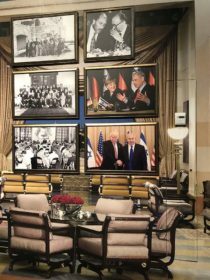 (Photo from the exhibition) It isn’t only the right-wing that criticizes Merkel as a weak leader who serves interests other than the supposedly German ones. Such ideas pave the way to Israel-related anti-Semitism: not (or not only) “the Jews,” but also Israel is suspected of pushing the fate of nations toward misfortune. Some of the other educators who had been invited thought that the Palestinian or Arab (national) perspective on the conflict had been prioritized, based on some objects or arrangements in the exhibition, with little attention drawn to the Israeli point of view, for example in a room with art installations. For example, photographs starkly depict the ugly sides of Israeli security installations, and generate negative feelings toward them, while the decline of suicide attacks is not mentioned. Unfortunately, there was not enough time to comprehensively discuss these points, or to consider together what significance the educators’ perspectives could have for the work of museum guides. A third planned point in the program also had to be omitted for lack of time: I would have liked to discuss these questions with the experts from various educational organizations: What precisely is the real connection between the Middle East conflict and anti-Semitism? Why and how should knowledge about the conflict or its origins, as well as on various interests or peace initiatives, counteract anti-Semitism? What role should teachers and educators play in this? But I had to hold onto these questions. I will be able to focus on them—and some preliminary answers—in my forthcoming presentation on the results of my work. 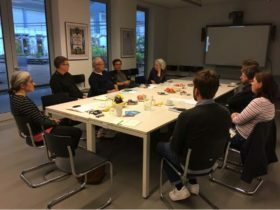 Like the first conference, the second meeting also resulted in another important insight: this kind of conference generates new ideas and inspires reflection on one’s own educational practices. They should happen more often! 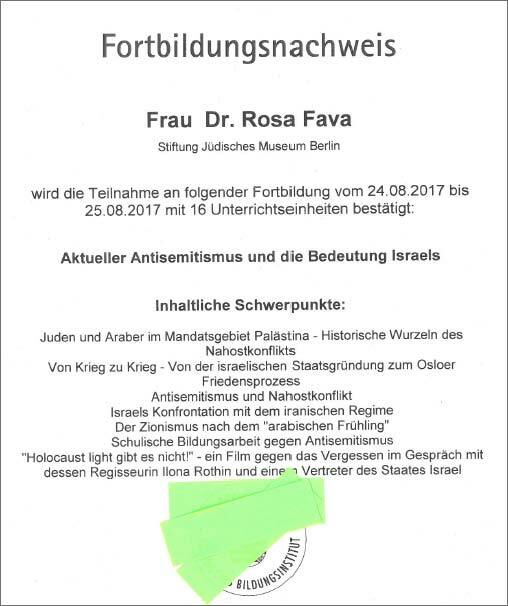 Rosa Fava would like to offer her heartfelt thanks to the Berthold Leibinger Foundation and the Jewish Museum Berlin, which allowed her to complete her W. Michael Blumenthal Fellowship—as well as all of those involved. These newfound insights will also be presented within the museum, and at an event in 2019, as soon as they take form. 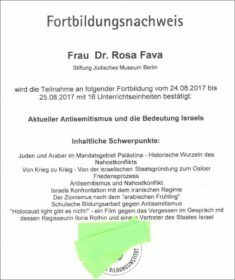 (Contact beginning in June: rosa.fava@amadeu-antonio-stiftung.de). I am curious about this topic,the anti- anti-Semitism-critical adult education.I’d like to know more about the reasons and the outcomes of this kind of education.I’m doing with an essay on humanitarian. Hope you can give me some constructive advice.Thanks!